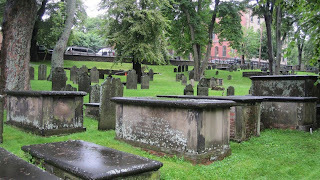 I've mentioned the Old Burying Ground in a couple of blog posts already, so I figured it was about time I made an actual post on it. 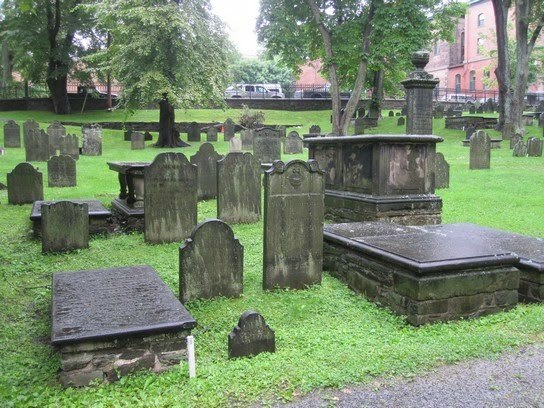 Located right on the corner of Spring Garden Road and Barrington Street, in Old Town Halifax, the Old Burying Ground was the original cemetery built in 1749 at the founding of Halifax. While there are only 1200 headstones in the cemetery today, over the years some 12 000 people have been interned here. Of course, the Old Burying Ground is also the home of the impressive Welsford-Parker Monument. An interesting fact is that all of the headstones were carved by hand using chisels and wooden mallets. Many of the original slate stones were quarried and carved around Massachusetts Bay and shipped over to Halifax before the American Revolution. The newer headstones are carved from local ironstone though, and are apparently of much lower quality because of it.